A 2 bedroom, 4 person cosy country cottage for holiday let. La Vieille Longère is an ancient Norman long-house, dating back to the early 1600's, situated in a tranquil hamlet of three stone- built houses. The Gite forms part of the long-house and is the most recent addition, dating from about 1770 and was used as a 'Maison du Tisserand' where traditional lace was once made. 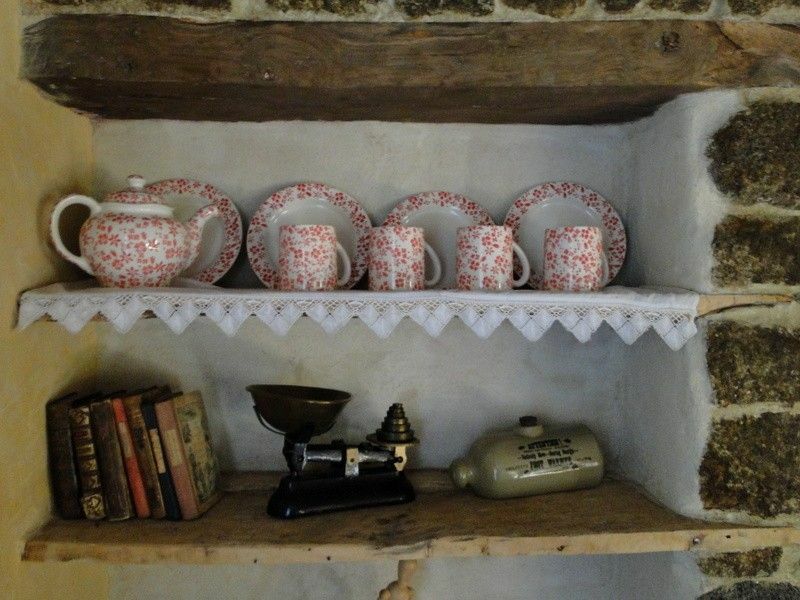 Restored by the Owners in 2011, the Gite offers cosy and beautifully decorated accommodation for four people in two bedrooms, one a large double with exposed beams, the other a twin room, both sharing a bathroom equipped with a powerful shower. The rooms are all centrally heated in colder weather but there is a stunning Esse Ironheart woodburning stove with an oven and hotplates for those who wish to use it. Just over an hour from the ferry port of Caen Ouistreham,The Suisse Normande is extremely convenient for visits to the Normandy D-Day beaches, the world heritage site of Mont St Michel and of course for walking or cycling through the stunning countryside. There is canoeing and pedalo hire on the nearby River Orne, paragliding and horse riding. For those fit enough to try out the hills around the area,we have 4 decent bikes that can be loaned out. The Suisse Normande is an area of especial beauty, rolling hills, deep valleys, both white water and slow moving rivers, and traditional bocages ( small fields surrounded by high hedges). It is the home of fabulous cheeses, cider, and poiré. We had a fab week here this year. The gite is beautiful, so well equipped, comfy and a real home from home. It was so peaceful that we struggled to wake up in the mornings (the addition of two teenagers didn't help either!). There is just nothing to disturb you. Nick and Lesley were the perfect hosts, going above and beyond to make our stay so very enjoyable. Canoeing down the Orne was a real adventure, and the Tree Top Park in Roche d'Oetre was just brilliant - much more varied tasks than Go Ape in the UK and challenging to say the least. We spent four and a half hours there and still didn't complete the course! The Normandy Beaches are also well worth going to even if you're not into the history behind them (but you can't help but be moved when you see them, especially at Arromanches where evidence of the landings are so very obvious to see). All in all a fabulous week, one of the best cottages we've stayed in. Thank you both so very much. A beautiful Gite, spotlessly clean with everything you could possibly need available. The bedrooms are light and airy and bigger then you might think. The lounge/dining is roomy and cosy especially on the cold rainy nights. We lit the Aga one evening and it was so warm very quickly. Lesley and Nick are lovely friendly hosts and provide loads of information about the area, what to visit and where to eat. We loved the rural location in the heart of Normandy and home from home feeling staying here gave us and will definitely stay here again. Gite idéal pour découvrir la Suisse normande ! Accueil très chaleureux. Nick et Lesley sont à la fois très disponibles et discrets. Le gîte a été rénové avec goût, il n'y manque rien. C'est un endroit idéal pour tous ceux qui aiment la campagne, les randonnées, le VTT (les circuits sont bien balisés), le repos... (à noter, la literie est très confortable). Nous avons passé un très bon séjour en Suisse Normande sous le soleil. Thank you Lesley and Nick for your warm welcome. We enjoyed our stay in your lovely cottage with its beautiful gardens. A great Cottage situated in beautiful surroundings of the Suisse Normande. Actually we had too little time to see it all. Thank you for your hospitatlity - we will return. Nick & Lesley - Thank you so much for a great week. Your place became our home and we enjoyed our talks with you and our adventures. Your suggestions helped make our visit to Normandy unforgettable.